Although director Edgar Wright (Shaun of the Dead) is currently prepping to shoot The World’s End, he’s apparently found enough time to put together a test reel for an Ant-Man feature. The Marvel superhero is a scientist by the name of Hank Pym who can change his size at will, from the miniscule to the gigantic. He also possesses a helmet that lets him communicate with ants. Wright was originally attached to the project when Iron Man and The Incredible Hulk went into production, although Ant-Man was sidelined to make way for the origin movies of the heroes that would go on to star in The Avengers. 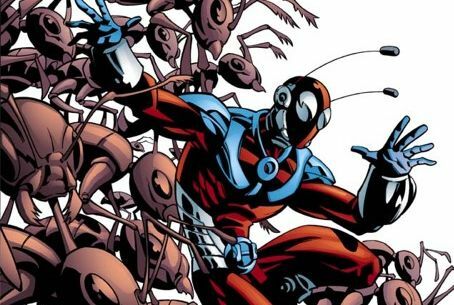 Ironically, Ant-Man was a founding member of the superheroic assembly; perhaps, if Wright’s test reel goes well, we’ll see an Ant-Man feature and a follow-up appearance in The Avengers 2. Hit the jump for more. Heat Vision reports that Wright and Ant-Man co-writer Joe Cornish (Attack the Block) quietly wrapped on the Ant-Man test reel recently. Read up on Wright’s comments about the project here. The test reel isn’t uncommon for movies that have a risky premise or have a stylized appearance; 300 and Battle: LA are prime examples. Wright had spent a little less than a week shooting in mid-June to get the tone of the film down and see how Pym’s powers played out on camera. We’ll have to wait and see how the studio reacts to what they’re shown. In the meantime, Wright will start shooting The World’s End this September with fellow “blood and ice cream trilogy” stars Simon Pegg and Nick Frost.